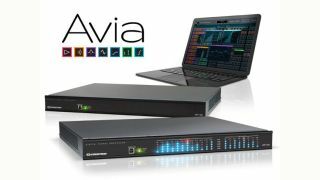 The What: Crestron is now shipping its complete line of new Avia DSPs. Consisting of five models, offering a full range of professional-grade features, Avia DSPs are designed to streamline audio programming, commissioning, and expansion in meeting rooms and video conference rooms. The What Else: The top-of-the-line Avia DSP-1283 is engineered for use in high-end meeting spaces and collaboration environments. It provides high-performance AEC that meets the most stringent professional standards on all 12 channels. DSP-1283 supports audio conferencing via VoIP and POTS, and USB connectivity for videoconferencing via a Crestron RL 2 Skype for Business solution, or BYOD presentation using Crestron AirMedia wireless gateway. I/O expansion with amplifiers and DigitalMedia blade-based switchers is supported via the Dante audio network. Additional models include DSP-1282, DSP-1281, DSP-1280, and DSP-860. All models leverage the Avia Audio Tool for audio design and programming. The Avia Audio Tool provides a workspace to streamlines audio programming. The channel-strip architecture simplifies configuration, with a library of preconfigured strips for the most popular microphones and Crestron speakers. Built-in tools include a real-time analyzer (RTA), virtual mixer, EQ editor, and state-of-the-art AEC processor. Avia DSPs connect directly to Crestron touchscreens without a central control system. There’s no code to write or GUIs to design. Just drag and drop channel strip objects for control and to generate a touchscreen UI, including VU meters for visual confirmation that audio is passing through the system without needing special test equipment. The Bottom Line: The new digital signal processors and software tools are designed to simplify audio programming, integration, and expansion in commercial applications. The new DSPs are a part of the new Crestron suite of Avia Audio Solutions, which also includes a companion line of network-controlled and monitored multichannel amplifiers. Avia Audio Solutions are engineered to work together to deliver optimal audio experiences for better meetings in huddle spaces, presentation rooms, and collaboration rooms.